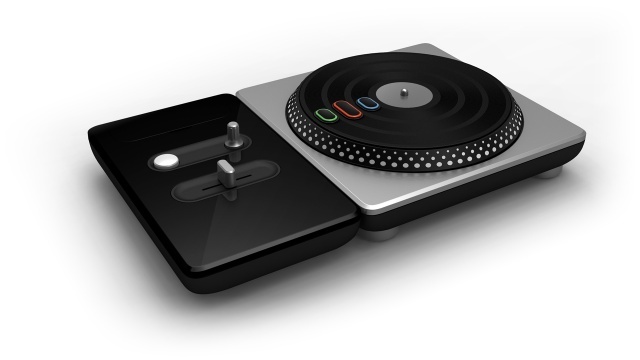 Santa brought me DJ Hero for the Wii this year for Christmas, and I have to say it’s the surprise hit of all of my new toys. I wasn’t quite sure what to expect. In the ancient past, I spent time both in the club scene and as a DJ, so it has a certain appeal to me, but I’ll concede that it’s not for everyone. Having spent some time playing Rock Band at a friend’s house, I can say that DJ Hero is quite a bit harder to learn (even at the easy level) than playing guitar — from a technical standpoint, there’s a lot more to “two turntables and microphone” than “a beat-up six-string.” But the music is great — top quality mixes, by big-name DJs — and the game play is addictive as you try to master the higher levels. Oh yeah, and I got mad skillz!